I don't know if it's because I spent half my childhood carving hideouts from the huge privet hedges that surrounded my home, or if there is another reason that I am drawn to arbors and tunnels like the one you see above (the photograph was taken in early spring at a nursery in northern California), but I love that feeling of walking underneath such structures, especially when they are covered in foliage or flowers. I have a tunnel that is 44 feet long. It attaches to the back of my house. 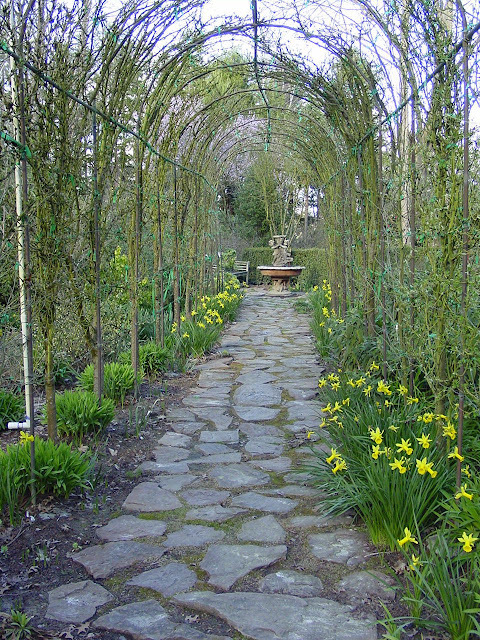 The arches are made of iron and are covered with yellow trumpet vine, Campsis radicans 'Flava', which starts blooming in June and lasts through July. I originally planted a double flowering wisteria, but it was a disaster in every way. The blooms didn't appear until after the foliage came out and were hard to see. The racemes looked like clusters of grapes that had gotten caught in an impossible tangle of vines. And, quite naturally, the plants got away from me fast. All of a sudden, I had thick, choking trunks going up the pillars of the arches. On top, errant shoots stood up in every direction, looking like some Medusa-gone-wild with a crop of hair 40 feet long and six feet high. The plants had been expensive mail order ones, but I was forced to cut them down to the ground. Now, I can control the trumpet vine (believe it or not) much more easily. But here's an odd thing. I once noticed a snake skin - a long one - caught up in the canopy. I somehow ignored this and didn't dwell on how it might have gotten there. A few years later, I'd hired a young man to do some pruning, and had pointed out some pieces that were out of place to be cut back. I was indoors when I heard this horrible scream. I ran out to see the ladder knocked over and the young man pointing up. There, resting in the vines was a coiled up black rat snake. I had to admit it was a bit disconcerting, thinking I had probably walked under the creature a dozen times that day. For days on end, the snake stayed, stretching himself along the iron connection pieces. I was constantly checking to see if he was still there. One day, I noticed that he was a lot longer than I had originally thought. In fact, there was no way this same snake could have grown another four or five feet. It dawned on me. There were two of them. In the spring, I see this type of snake a lot. To be sure, I look up every time I pass through the tunnel. I'll also find him/her coiled up in various places, especially in this new little garden I've made. But, this isn't about snakes. It's about the beauty of tunnels used in the garden. Yesterday, I was searching online for garden arches. I want to connect a series of arches in yet another garden place I'm making. The above photo is of a laburnum tunnel. You can see the line of trees and supports. In another month or so there would have been long golden chains of flowers hanging down (note the cyclamineus daffodils; I love the swept back petals). We can't grow laburnums in the South, but I did see such a series of arches in another California garden near San Francisco. The gardener had trained deciduous magnolias on iron frames. She had also planted clematis to grow up the trees. It was a great look and lent some organization to an upper garden that might otherwise have been left wild. I do have a photograph of my tunnel, but it was taken on a snowy day. Finally, we have some sunshine, and it's going to warm this afternoon. Thus, I'll save my snaky, snowy tunnel for another time. You know I immediately thought of Susanne Hudson's garden with this pic !! !